Today (Sunday March 2nd) is Read Across America Day, aka Dr. Seuss's birthday. Since this day occurs on a weekend day this year, it will be celebrated in schools across America on Monday. 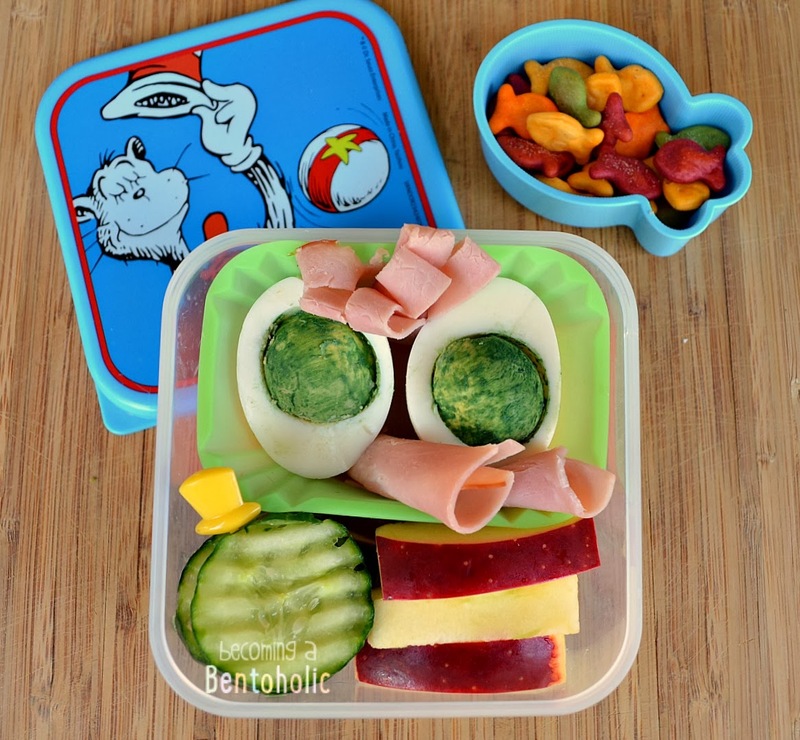 I decided to make a quick and simple lunch this year and yes, this time I did green eggs and ham (for all those that were expecting it last year!). In this lunch: Green eggs, ham roll ups, cucumbers, apple slices, and tucked underneath the green cup is a whole row of baby carrots. I also packed a side snack of colored gold fish. Might as well add another Dr. Seuss book to today's lunch....one fish, two fish, red fish, (in a) blue fish. haha! I "painted" the egg yolks with my natural dye free food coloring. I also added the little yellow hat pick to represent Sam-I-Am. Ahh haaa! This is SO MUCH FUN! ~ Anna you are Awesome, babe! I love how the eggs look like eyes staring back at me - and poking out a tongue!